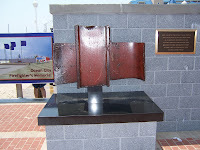 Mary and I will be heading back to one of our favorite beach stops, Ocean City Maryland (KOXB). This early August trip will have us making a quick run to 40N Chester County to pick up two "first time" General Aviation passengers. From Chester County we will again head south back towards our home base KILG, Wilmington, Delaware. From the home drome we'll continue south to Dover Delaware via the Smyrna ENO VOR. I hope we have clear skies so our passengers can get a good look at the Dover AFB and Dover Downs/Monster Mile (for the NASCAR fans). Once crossing ENO I'll dial in the Waterloo VOR at 112.6 and over fly the Cape May Lewes Ferry Terminal in Lewes Delaware. 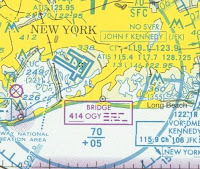 From ATR it's a straight shot south for about 30 miles then setting up for pattern entry to KOXB. We plan on spending two nights with a scheduled return on Saturday. If the weather looks good we'll head out one day to take the ladies shopping in cape may while the men stroll through the aviation museum. We may even saddle up and head to Millville for a museum tour also....you know the ladies will not be done shopping. 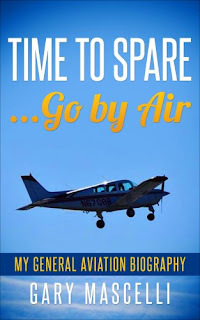 For the non-flying readers this trip by car would take about 45 minutes to Chester County from Wilmington and then another 3.5 hours to Ocean city Maryland from the Chester County Airport. 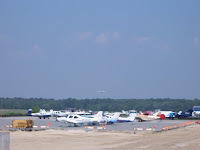 By aircraft it will be 15 minutes to Chester County and then 1 hour and 15 minutes to Ocean city, MD. Late September is shaping up for a southern run. Two stops on the flight plan drawing board will have us spend two nights in Williamsburg/Newport News, Va and adding KPHF Newport News as a new airport. As much as we both love JGG as a place to land, PHF will serve us a bit better this trip since our friend Susan is providing the wheels. We plan to attend a show at the Ferguson Center (always a must) to see the play Hairspray and of course who can resist a day at Busch Gardens. Mary and I each purchased a season pass on our first visit this year, it will provide a cost savings, which is always good for more Av gas. The second leg of our trip will have us departing KPHF, Newport News, VA and heading further south. 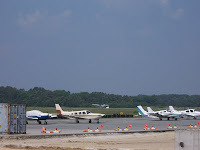 We made arrangements to stay on the beach in North Myrtle with a first time visit to Grand Strand Airport,KCRE. Our room will overlook the beach and we will spend two nights and three days of pure R&R. Mary checked out a few shows at the Palace theater for evening entertainment so that should be fun. I decided to start posting drive times for the non-flying folks who read about our travels. The trip to Newport News, Va from our Home in Wilmington, Delaware takes about 5.5 hours with traffic moving steady. This flight takes about 1.5 hours en-route and I figure the pack/unpack of a vehicle or aircraft is a wash. From Newport News, VA to Myrtle Beach, SC is about 6 hours by car and 2.25 hours by air. Here I sit on Friday filing away my flight plans for Martha's Vineyard (KMVY) and instead packing a headset bag for a short hop to Millville, NJ for breakfast tomorrow morning. Mary has been dealing with kidney stones all week and just doesn't feel up to 2.5 hours in the air to KMVY. The North East Flyer's group will be heading into MVY and meet for lunch at 11am at Seafood Shanty, not to be confused with the restaurant chain. I wish them blue skies and safe flights! Tomorrow will be a short hop to Millville (MIV)and Antino's for some breakfast. Following the morning eats will be an equally short hop home to Wilmington (ILG), then to the house in order to study for my mid-term exam. It sure will be hard to concentrate on Aviation Legislation while listening to aircraft fly over the house. Well it was a short hop but it was worth it! 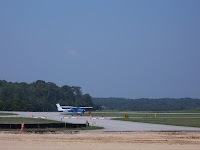 We fired up for Millville and taxied out to runway 1 at Wilmington. I was directed to back taxi on r/w 1 then turn, position and hold. 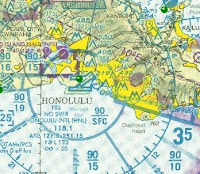 I entered off taxiway 'K'ilo and back taxied a few thousand feet. I turned into the wind and announced my position and hold. Once cleared we climbed out to 3000' and took in the scenery. Crystal clear today, you could see the Atlantic City skyline and well south into the Delaware Bay. Breakfast as always was fantastic at the Cornerstone Grill. I had the breakfast quesadilla and Mary had two eggs bacon and toast. We walked over to Big Sky to pay our fuel bill. I decided to top off the tanks before heading home. 679er took 21 gallons to top her off and that totaled $94. We departed Millville as traffic really started to pick up. I counted 5 in line to depart on runway 10 as I turned cross wind followed by down wind in the pattern. There was a Challenger jet inbound for down wind 10 which means he would be coming at our six o'clock. I climbed out to 3000' and announced clear of the area as the jet settled in the down wind leg of the pattern (parallel to the runway). Wilmington was also getting busy as we entered the right base for r/w 1. I was cleared to land and had another jet on a long final. Neither of us had visual contact, but I couldn't see behind me. I landed very smooth with the stall horn singing. My zen moment was interrupted by the tower as he directed me to expedite to the first taxiway 'D'elta on my right, noting a jet was on short final. I acknowledged with expedite right turn Delta for 679er. I cleared beyond the hold short and flipped over to ground when the jet came roaring by thrust reverser's fully engaged. We quickly buttoned up 679er and headed for home. It's a beautiful day out and we intend to spend it out and about, after a cool drink and short nap. Sunday Mostly sunny. Hot and humid with highs in the low 90s. Southwest winds 5 to 10 mph. Heat index values up to 100. The wx-man told no lie today, it was hot, hazy and humid! Mary and I spent yesterday at her cousins wedding outdoors and it was just gorgeous, all day. Today on the other hand called for the three H's and what were we planning? A Flight to the beach! 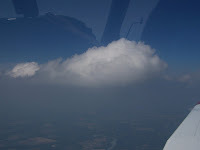 We departed Wilmington (KILG) around 9:30 local time or 1330 zulu time for you pilot folk and climbed into the haze. The plan was for 5,500 for the first leg, Wilmington to the ATR (Waterloo) VOR. The second leg I planned on descending to 3,500 from ATR to Ocean City, MD. The pattern was getting busy so I over flew OXB at midfield 1,800 feet (TPA 800') and repositioned for a 45* entry to 32 left down wind. I made an ok landing with only a short burst of stall horn, I need to work on that. We taxied off and locked up 679er then hooked up with the OXB staff for a shuttle ride to the terminal. Mary and I each downed a bottle of cold water and waited for fellow POA forum member Bob his wife Dru and baby Mackenzie. We also had the pleasure of meeting Bob's Mom Lin, she was a blast. Bob made a nice landing, very smooth and we got a few pictures of 09L as they taxied to parking. We all piled in a taxi van and made our way to the beach. 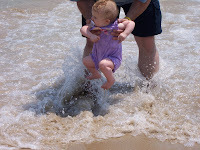 The taxi dropped us at the usual spot "Tony's Pizza" and baby Mac went for her first dip in the Atlantic. What a lucky child to have such great parents and are they lucky to have such a good baby. The group then headed north on the boards for lunch. We passed by a few places and ended up at "Shenanigans". This place had the fans going and the A/C turned on, it looked promising. The service was very good and the lunch equally as good. Full tummy's and plenty of fluids consumed we were feeling recharged, non-alcohol for the pilots of course. The ladies hit some shops, Bob and I commented on the banner tow operations and we all worked on our tans. We hopped a ride on OC's version of the "tram car" and headed south to almost the end of the boards. 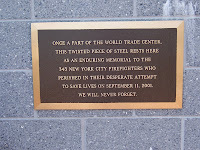 In our travels we checked out the Fireman's Memorial and the 9/11 tribute, both very nicely done. 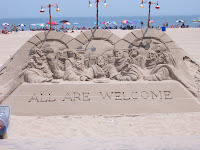 We also passed a few works of art created in the sand, I took pictures our last trip and of course added to the collection this go round. We walked through the rides area and all agreed to stop for some soft Ice cream or custard as some call it. I had banana which was a first,I had never seen banana soft ice cream. Tony's Pizza now in sight prompted a call for the taxi. Service was pretty fast, before you could get any shopping in, the driver was out opening up the back doors. Our group piled in, the stroller was secured in the back and we were off for the airport. Bob and I checked the weather on DUATS, thankfully Bob knew his user name and password. The Op's folks gave us a ride out to our aircraft and we said our good-byes. We each pre-flighted and then saddled up for home. Mary and I were off in 679er about ten minutes before our counterparts in 09L. Runup completed, I departed r/w 20 and climbed out over the ocean. Nice view on the cross wind and down wind of the beach and boardwalk. I made a call 5 miles north of OXB for Patuxent Approach but got a standby. 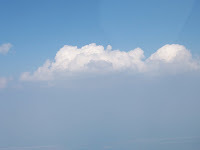 A few minutes later I was given a squawk code for flight following and felt better with the extra eyes in this haze. I climbed to 6,500 through a large gap in the clouds and had a much better view now vs plugging along in the haze at 3000. I was turned over to Dover Approach and motored along requesting to descend to 4,500 to maintain VFR. A few minutes later I heard 09L request 4,500 or 6,500 from Dover and was granted the climb. I switched over to 122.75 and let Bob know I was "in it" at 6500 and was now good at 4500, he acknowledged. I was crossing the Delaware River at the top of the Bay and Dover turned me loose to squawk VFR but offered numbers for Philadelphia approach. We crossed the river and having "just" spotted the Salem nuke towers I then started a slow descent for ILG. Wilmington tower directed me to report a left base for r/w 27. I made out the Delaware Memorial twin spans barely and headed for a spot in the middle, between the airport and the bridges. That position always puts you on a nice left base for 27. I called out a three mile left base and was cleared to land. Nice and smooth on the way in about 60kts with stall horn letting me know I wasn't flat. A squeaker landing had us rolling out needing to add power just to make taxiway 'M'ike. As soon as we got out of 679er we heard an aircraft overhead, it was a Cessna doing pattern work. Two jets the landed, a Lear and then a Dassault Falcon 2000 (N1C). Mary alerted me to a high wing overhead and asked if it might be Bob and Dru in 09L. I checked it out but could not make out the blue stripes, although the underside of its tail looked blue. I guessed its altitude at about 3,000. We jumped around and waved like two nit-wits wondering if they saw us. Yes the heat was getting to us both! With 679er secure Mary took the keys and drove us home. We each gulped down another bottle of water as we unloaded my flight bag and the plants we left in the truck from yesterday. Maggie was happy to see us as she jumped around either from excitement or she really had to go, either way I let her out back. As I sat here starting to type the write up Bob called to let us know they were all home safe. A GREAT day with friends really made the trip worth it. I know the ladies were talking of a Williamsburg trip and a trip to midcoast Maine. I'm sure I will be posting a write up soon! What a GREAT day today!!!! I think my solo flight and checkride perma-grin is back! I had the opportunity today to fly in the Gulfstream IV flight sim for an hour. I started off with a taxi test which I did just fine then everything was reset for a departure from JFK. I was there to fly so I was lucky not to have all the checklists and communications to deal with. I was rolling (without the full motion on) and rotated about 175 kts with a nice climb out over the ocean. As soon as I confirmed positive climb I took out the flaps and tucked the gear away. I maintained a VFR flight as I headed back over New York at 10,000. The sim was reset for a 6 mile final daytime. At 220kts I asked for the first notch of flaps then around 180 the second a got a warning light for gear. I was told gear before the second flap setting. OK, gear down with three in the green. My speed was a bit fast as I had to muscle that thing, good lord it was like driving a tank. I was told there is plenty of runway, don’t force it. I crossed the numbers held the nose high listening to this thing squawk out altitude. Finally the mains were down and I was pushing the nose over. I brought the Thrust Reversers (TR)in and wow do they add the stopping power. Once below 60kts I added brakes and taxied clear. Round two was a night departure and landing from JFK that was much smoother. 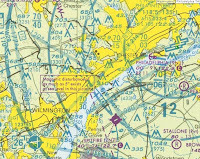 I was then reset for KILG, Wilmington, DE my home airport. This time he felt I could handle full motion. I cracked the guys up with a short field take off…..laying on the toe breaks as I brought the power up. The full motion now activated actually pushed you back into the seat a bit. I felt every bump in the runway. 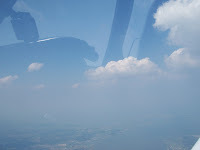 Once airborne I pointed towards KPHL and held at 2800 feet. My first try at KILG for a daytime landing had me low and slow crossing the fence and hitting on the numbers with the mains. I had a slight crosswind tossed at me and planted the left main down first followed by the right then nosed over and rolled out. TR's now engaged. I was slowing down with slight brakes at the 1000 foot marker. I made a nice turn off to the taxiway. The full motion was wild, you could feel the gear cycle through and as the mains touched down you could feel the vibration on roll out. The best was the buffeting when the flaps were added. I then did a night time take off and landing at KILG. The last trip was from Hawaii! I took off from PHNL runway 8R and was looking at some mountains. He said please don’t crash the sim, and I didn’t! The instructor thought I did very well and decided to throw a thunder boomer at me along with heavy rain. Greaaaat, just what I needed. I told him I was working on the ground portion of my IR and was excited about getting hood time. He said you can experience actual conditions here and then we really had some fun. We were talking about systems and such as I thought he was trying to distract me (checkride memories). Sure enough I thought I was straight and level but a scan of my instruments revealed I was slowly fading off to my right. He kept talking and I went on instruments and got squared away with little altitude loss. He commented on my quick recovery. He warned me how fast people loose it in those conditions and advised me to continue with my IR, it will make me a better pilot. All in all, a GREAT time. It was a great experience and I was very thankful I had the chance. I treated for lunch and that too was well worth it! !